The Family Manager system turns on sound business principles. Every family is an organization, and every organization needs a manager. Most often it’s mom; sometimes it’s the dad. In every case, the partner who answers the high call is neither an autocrat or the family’s live-in maid. The strategies used by successful business managers will help you realize your dream for a happy, smoothly running home. Here are the ten most important things to know. Think like a manager. You oversee the most important organization in the world. 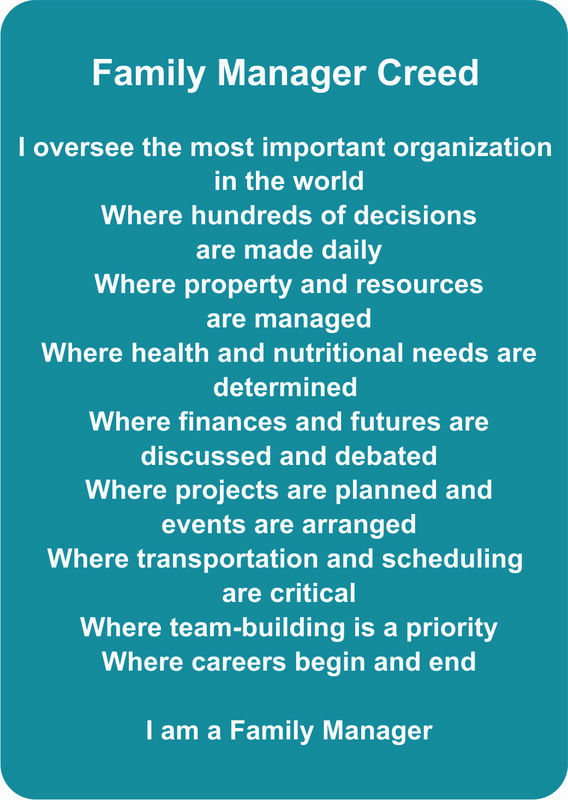 The Family Manager Creed summarizes the Family Manager’s role. Know your mission and values. Decide what’s most important to you and your family. Priorities help guide daily decisions that have short- and long-term implications, and shape your family culture. Cast vision and communicate benefits. Successful managers must inspire and attract employees around a common goal and communicate how that goal affects each person’s best interest. It’s no different in a family. Build a family team. All good management is about sharing responsibility, helping people find their niche, and empowering them to succeed. Create a base of operation. As your family’s manager, you need a “Control Central” from which to supervise your family’s comings and goings. Use a Daily Hit List. Selectively choosing each day what you will Do, Delete, and Delegate in each department will help you manage tasks and alleviate stress. Manage according to how you’re wired. Family management demands a set of skills that no one person has. There will always be jobs you hate. The trick is learning to work with your strengths and work around areas where you are not gifted and through people who are. Be prepared. It’s the Scout motto, but it’s also a good motto for Family Managers. Lean on God. He created the family and will give you the wisdom and strength you need to fulfill the responsibilities of your various roles.